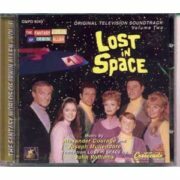 First produced in 1996, and now out of print, this mint, original shrinkwrap, never played music cd, volume 2, contains music from the original TV soundtrack of `Lost In Space’. These recordings are from various episodes as well as the main and end titles. This is a mint 5″ X 2 1/2″, embroidered patch featuring the logo of the Jupiter 2 spaceship from the hit, cult TV series, “Lost In Space”. 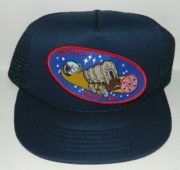 This is a cotton baseball style hat with a polyester nylon mesh back and a mint, embroidered patch featuring the logo of the Jupiter 2 spaceship from the hit, cult TV series, “Lost In Space” on the front. This was the name of the ship used in the series. It is available on either a blue or black hat. If you do not choose we will send our choice. 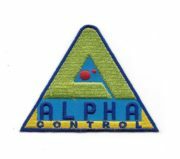 This is a mint patch measuring 2.75″ high and featuring the logo of Alpha Control from the hit, cult TV series, “Lost In Space”. 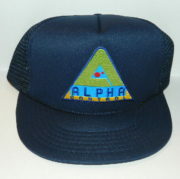 This is a cotton baseball style hat with a polyester nylon mesh back and a mint, unused patch measuring 2 3/4″ high featuring the logo of Alpha Control from the hit, cult TV series, “Lost In Space” on the front. It is available on either a blue or black hat. If you do not choose we will send our choice. 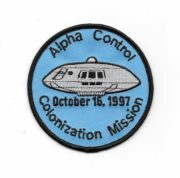 This is the logo of the Alpha Control Colonization Mission, which was launched on October 16, 1997. It pictures the Jupiter II from then hit TV series “Lost In Space”. 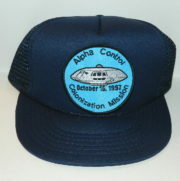 This is a cotton baseball style hat with a polyester nylon mesh back and a mint patch measuring 3 1/2″ across featuring the logo of the Alpha Control Colonization Mission, which was launched on October 16, 1997, on the front. It pictures the Jupiter II from then hit TV series “Lost In Space”. It is available on either a blue or black hat. This mint, unused licensed metal enamel die-cut pin in relief features the Jupiter 2 Spaceship from the original hit sci-fi TV series Lost In Space. 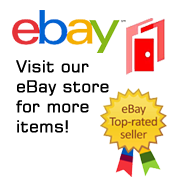 It measures 2.125″ wide x 2″ high and has been stored in a smoke and pet free environment. 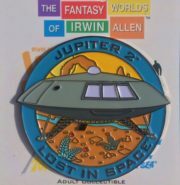 This is the second in a series of licensed pins paying tribute to the Fantastic World of Irwin Allen. 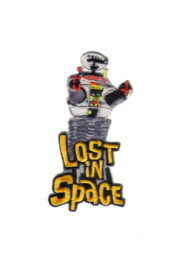 This is the figure image of the B9 robot seen of the cult sci-fi TV series “Lost In Space”. This embroidered patch measures 4″ tall.